As much as I hate to say it, we are entering the stage of puppyhood I like the least – teething. While I adore having a puppy in the house, I’ve never been a fan of teething. Not just because of the potential for destruction, but you know the poor pup is uncomfortable and in pain. When Reya was a puppy, we struggled with this stage and learned the hard way what happens when you leave a puppy alone as they are trying to deal with their teething urges (let’s just say it ended in wall patching, and two badly damaged kitchen chairs). It didn’t take us long to learn that toys are our best friend, especially ones that stimulated her mind and playful nature, while easing her mouth pain. 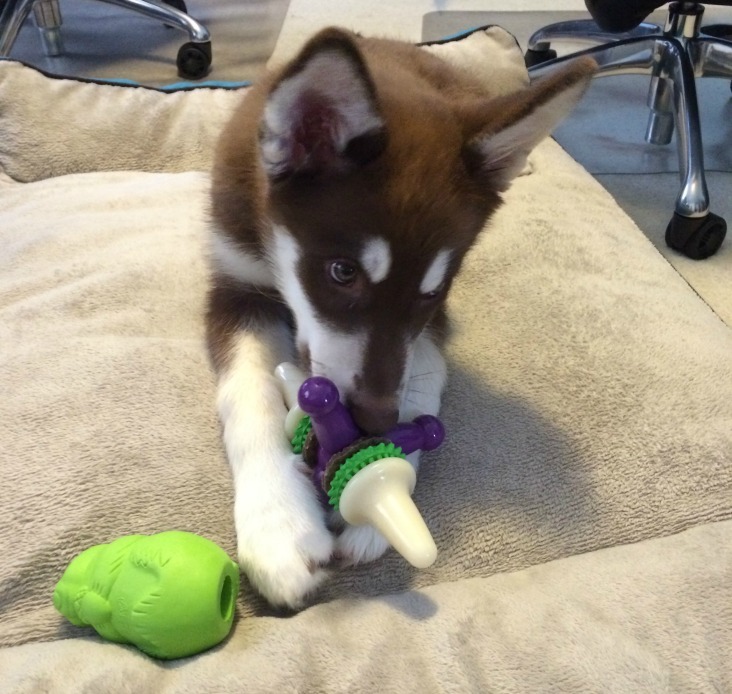 Luckily, Petsafe has a variety of awesome puppy toys for teething puppies! Looking for a fun chew toy with a classic twist? If so, we think you will love the PetSafe Busy Buddy Jack. This cute toy is shaped like a classic jack and is designed to not only be durable for dogs, but has treat holding ring areas to keep your dog challenged. By taking apart the middle, pet parents can put a ring of Busy Buddy natural rawhide treat or chicken flavored dental ring on the toy, encouraging your dog to bite on the toy and work at getting the treat off the center. This not only challenges your puppy mentally, but keeps them busy for hours! Best of all, the treats are made in the United States, allowing you to rest easy that your puppy isn’t getting a hold of anything dangerous. Pet parents will also love that this treat is top rack dishwasher safe, making cleaning as easy as possible. Right now, this is Ivi’s favorite toy. She has been carrying around this toy with her everywhere and doing her best to keep it from Reya. Not only is she chewing on it during the day, she has been trying to bring it to bed with her as well. With Ivi teething right now, I couldn’t think of anything better since the different textures and shapes engage her while letting her bite at different angles to help soothe her mouth. I think she also loves that she can manipulate and spin this toy with her paws, making her quite happy. Based on our own experience, we are delighted to give the PetSafe Busy Buddy Jack an A+ rating and highly recommend it to anyone with a teething puppy! 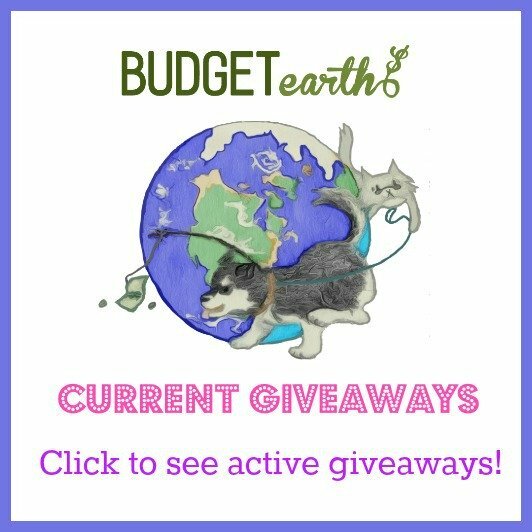 Looking for a toy filled treat that can keep your puppy entertained? if so, we think you will love PetSafe’s Busy Buddy Squirrel Dude. 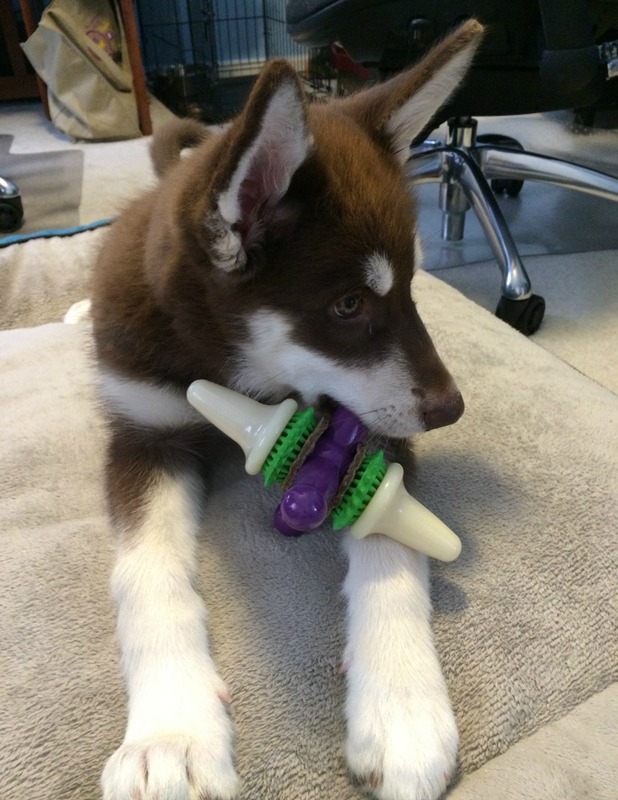 These highly durable toys are designed to be super strong, but gentle enough for little puppy teeth. With the patented Treat Meter inside, the toy can also hold a variety of different treats, including dry kibble, dog treats, cheese, and even peanut butter to reward puppies for chewing on the toy, rather than human valuables. For even more fun, the toy bounces as well, helping hold your puppy’s attention. As well, these toys are top rack, dishwasher safe, making life easier for pet parents. So far, this toy is a major hit with Ivi. She was playing with it before I could even get it out of the package, or she understood what it could do. Our biggest issue is actually getting it AWAY from her to put treats in the toy itself – she loves this toy that much. The little treat area also randomly gives treats as she is playing, which is pretty cool, especially with her adult teeth starting to come in. The only problem we have is that big sister loves this toy too, and tries stealing it from little Ivi. We are planning on ordering the adult dog size of this toy for Reya so that she will stop stealing the Ivi bitty puppy’s version! 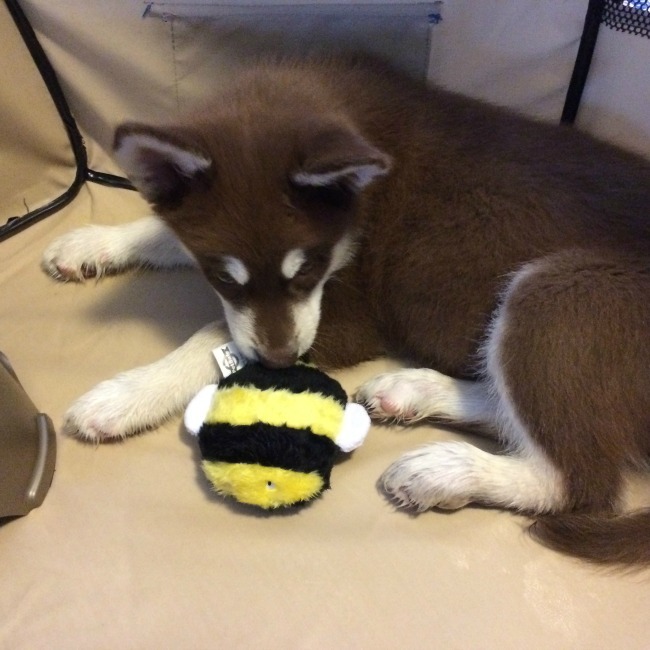 Since both dogs absolutely adore this toy, we are happy to give it can A+ rating and highly recommend the Petsafe Busy Buddy Squirrel Dude to all of our readers! 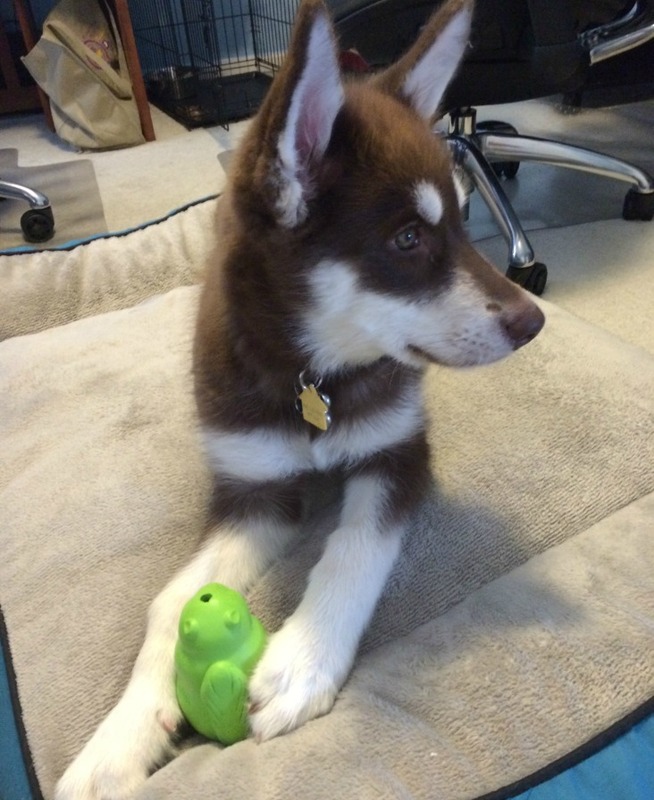 Looking for an adorable, safe toy for your favorite dog? If so, we think you will love the PetSafe Pogo Plush Toys. These unique toys are a fun and creative way to make fetch and tug of war more fun. As well, dogs will love picking up these toys by their ears, tail, antennae, or even legs to make grabbing, shaking, and tossing even better. What makes these toys so unique is their patent-pending design – it gives these toys a unique bounce-back action and additional resilience that dogs seem to prefer over traditional plush toys. The difference in behavior comes from the fact that these toys contain no stuffing, but instead have an inner frame that is bouncy , durable and has a free-floating squeaker inside. This means that dogs who love tearing up ordinary toys to get to the stuffing (and all the gastrointestinal dangers it presents) can now have a soft, plush toy that is far safer and much more sturdy! Currently, you can get these toys in five adorable designs including rabbit, beaver, bee, ladybug, and panda. With two great sizes for dogs, it is easy to see why dogs of all breeds and ages love Pogo Plush toys! In our household, these toys are a major hit. Ivi loves cuddling with these plush toys, and squeaking them when she decides to be a bit more playful with her little ‘friends’. At well, it isn’t too uncommon for her to try borrowing big sister Reya’s large Pogo Plush toys for playtime. What is also great about these toys is that they aren’t just durable to dog teeth, but durable enough to withstand constant washing from ‘puppy accidents’. To learn more about what our girls think of this toy, check out our full Pogo Plush review. Want to purchase some of the adorable toys featured in this review? Head over to the PetSafe website to see their full line of toys for dogs and cats of all ages. Also, you can find many of their toys at your local pet retailer or on Amazon.com. Want to help? Follow PetSafe on the following Social Media Channels! Too cute! Our puppy was too much of a chewer, we had to give her tough nylabones right away! She still likes chewing on them from time to time, but glad she no longer feels the urge to destroy my flip flops or blankets! I don’t usually do dogs, but this is the cutest little dog that I have ever seen! If I was going to get a dog, I think this is the kind of dog I would get. 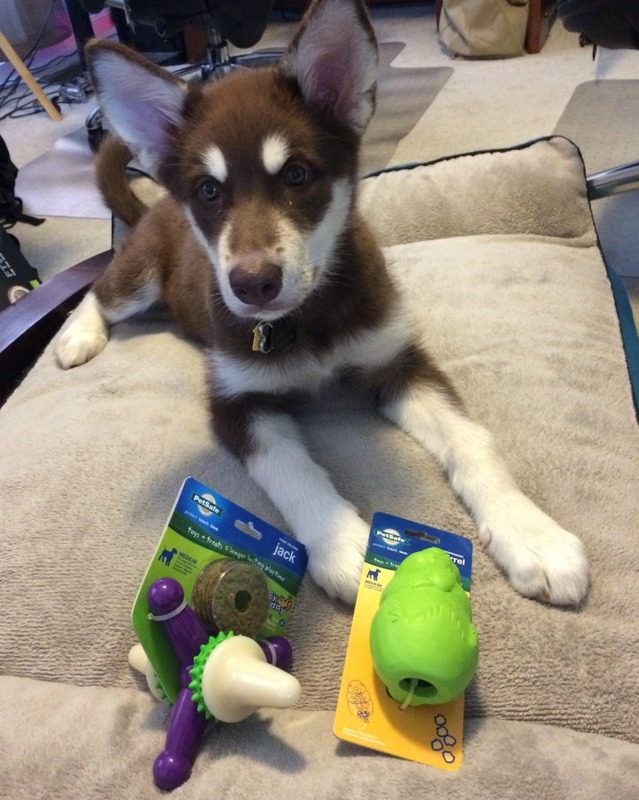 Every puppy needs a lot of teething toys, and hard crunchy edible snacks. Having these will keep your puppy from getting in trouble. We have a lot of petsafe toys in my house- great quality.